Because I am a girl…report. I spent the last few weeks volunteering at Plan Australia in the brand and communications department. For those of you who don’t know, Plan is a non profit, non political and non religious organisation that assists children in over 60 countries by bringing sustainable improvements to their communities. These countries are mostly in Africa, Asia and South America. People are also able to sponsor a child, and Jamie Durie is one of their ambassadors. 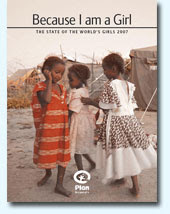 In my second week of volunteering, I became aware of a report that Plan is conducting called ‘Because I am a Girl: The State of the World’s Girls 2007. This will be the most comprehensive report ever published on why millions of girls and young women are being condemned to a life of inequality and poverty. The report states most girls and young women in the world’s poorest communities are powerlessness, a situation that should not be allowed to continue. There was a news story on SBS a couple of weeks ago, which spoke about Plan and the report. I only saw it when I was in the office, but it talked about the 2007 report that warns that six of the eight Millennium Development Goals agreed by world leaders are likely to fail girls living in poverty. The report warns the goals will be missed altogether unless world leaders adopt a tougher stance on the enforcement of international laws set up to protect girl’s rights. Plan will be the first to produce a global report series on girls and young women each year from 2007-2015. Plan will continue to follow the lives of 135 baby girls living in nine developing countries as part of a group study on girl’s rights and gender discrimination. This ‘life cycle’ approach in each report will provide an important lens for examining girls’ rights and will bring to life the inequalities buried in global statistics. * 62 million girls do not attend primary school. Global statistics on the extent of female foeticide, early marriage, abuse and violence and the lack of education given to girls in poorer nations are pulled together in this report. Each chapter links to the United Nations Convention on the Rights of the Child and imposes the question ‘What still needs to be done?’. Real life case studies, action plans, ‘Girls’ voices’, and a table listing 59 years of international legislation specifically addressing girls’ rights are presented within the report. Or visit www.plan.org.au for news updates. I still find it hard to digest that while we have Wii and ipod’s and the chance of so much education and 24 hour convienence stores, and the choice to be whoever we want, some girls don’t get much of a life at all from the moment they are born into this world. What are your thoughts about this study? I’d be keen to learn more about this – It often seems so futile to try to remember girls have it worse off than you because how can you imagine such a terrifying, horrible situation in such a lucky country? We don’t have enough voices from these girls spoken in Western societies – something very sorely needed. I’m looking forward to more work from Plan. This entry was posted in Uncategorised and tagged multiculturalism, volunteering, women's issues. Bookmark the permalink.